Bazzill ROBIN'S EGG Card Shoppe Heavy Weight 8.5 x 11 Cardstock at Simon Says STAMP! 42109 /10.2 This item is on reserve until If you would like to reserve this item now, you may purchase it now with the rest of your order. We will hold your order now and ship your entire order as soon as this item is back into stock. If you would like your order to ship now, please place this item on a separate order. Success, Bazzill ROBIN'S EGG Card Shoppe Heavy Weight 8.5 x 11 Cardstock has been shared! Smooth, 100# heavyweight cardstock folds with a crisp edge and will not warp when used with markers, inks or mists. Also handles loads of embellishments without sagging. 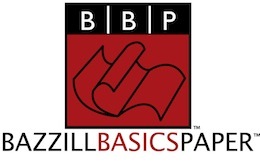 Established in 1999 by Doug and Marti Jones in Arizona, Bazzill which rhymes with razzle was launched in 1999 Basics Paper began providing premium cardstock in custom colors, textures, and sizes to independent scrapbook stores and craft retailers. Today Bazzill products are sold around the world. Bazzill's selection of premium cardstock has become a crafting staple and a must-have for loyal customers. Acquired by American Crafts in 2014, Bazzill cardstock remains a beloved fixture in the scrapbooking and crafting industry.